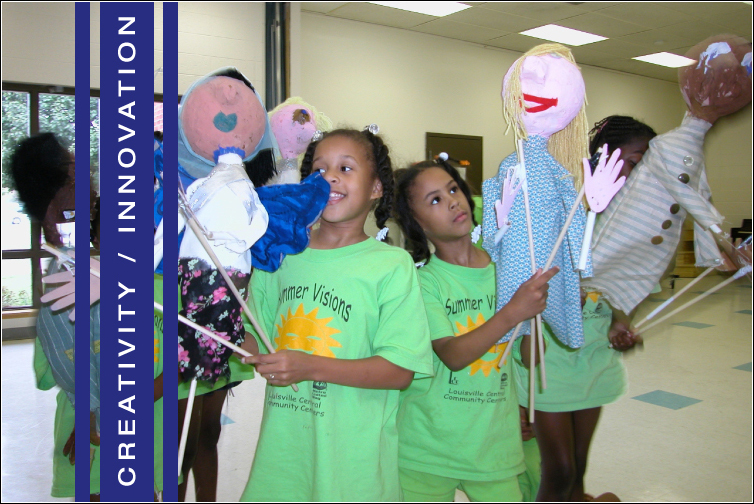 Children from the Louisville Central Community Center, explore puppetry. Links to a wide variety of educator resources separated into arts discipline categories. Through a partnership between the Kentucky Arts Council and the Kentucky Department of Education. The Arts First Aid Grant Program provides Kentucky school administrators, teachers and students with a high quality intensive arts education experience that aligns curriculum with the Kentucky Academic Standards for the Arts. The Folk and Traditional Arts Apprenticeship grant provides up to $3,000 to a Kentucky master traditional artist to teach skills, practices and culture to a less experienced artist from the same community during the course of a year. Poetry Out Loud is a national poetry recitation competition created by the National Endowment for the Arts (NEA) and the Poetry Foundation and administered in partnership with the state arts agencies. Each participating school receives an artist residency and the opportunity for the school champion to attend the state competition with a chaperone. The state champion goes on to the national competition in Washington, D.C.
Each spring the Kentucky Arts Council hosts the state-wide Poetry Out Loud competition for high school students. Kentucky’s state champion proceeds to the national finals in Washington, D.C., in April. The Teaching Art Together Grant lets teachers collaborate with practicing, professional artists on the design and implementation of innovative one- to four-week residencies. Residencies provide teachers with the tools to continue to incorporate the arts into the curriculum after the residency is completed. The Teaching Artists Directory is an online directory of Kentucky artists who produce high quality artistic work and have the skills and competencies needed to work with teachers and students in designing and implementing arts education programs. An online directory of Teaching Artists that have been juried into this program. The TranspARTation Grant enables Kentucky teachers and schools to offer students high quality arts experiences by providing transportation funding. Grants will be based on the mileage from the school building to the arts organization or performance venue and the number of buses necessary. Grant requests under $100 are ineligible.